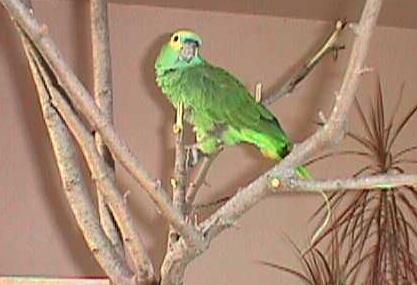 Basil the Bluefront Amazon came to us with aggression and plucking problems. He was clearly unhappy and depressed. After a lot of experimenting with his environment, we decided that Basil didn't want to be a people-pet, he wanted a bird for a friend. 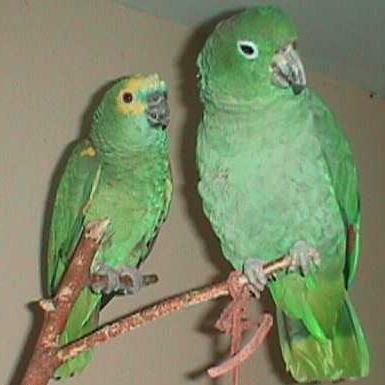 He's now cagemates and best pals with Chester the Mealy Amazon, and is a much happier bird. He may never be friendly to be people, but so what? When we adopt a bird with behavioural issues we often hear a familiar warning; "Don't put him with another bird; he'll bond with it and become aggressive again." I hear this especially when I take in Amazons. Even people buying new young birds are still sometimes given this warning, despite ample evidence that a bird can have a good companion relationship with a human, and still have a bird friend as well. But the purpose of this article is not demonstrate that birds can bond with people AND other birds that's been done. I want to propose a heresy: I have decided that it's more important to make the bird happy than to make it a pet. I can hear the chorus; "Well, of course!" Yes, but...well, let me tell you about Basil. Basil is a male Bluefront Amazon, and was placed with me as a nine-year-old in the summer of 2000. He was my first Amazon. He had been a shop bird for much of his life, and then taken home by an employee who had other bids, including another Amazon. He began to display classical symptoms of jealousy and hormonal rage, beginning with biting, then flying to attack people, then plucking himself. When it reached the point where his keeper could only handle him with a stick, they asked me to take him. I brought him home, with the warning firmly in my head "no other Amazons, or he'll get mean". Duriing his quarantine period, he never even offered to snap at me. He was occasionally shy, and allowed no petting, but that's all. When I took him to the avian vet for his first checkup, she was amazed at how passive he was. 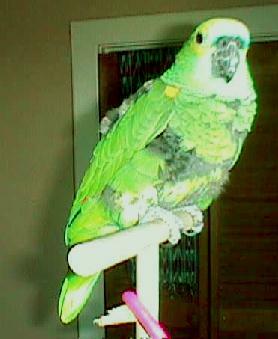 After quarantine, I moved him into a room with a few Conures; a Nanday, a Bluecrown, etc. He ignored them, sat and looked out the window, and stepped up and down like an angel. 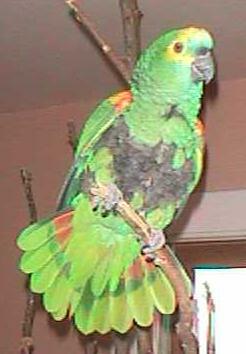 THEN, one day, I brought my Patagonian Conure to visit. This is a bigger bird, and a female. The first time I tried to pick up Basil with Cosmo the Patagonian in the room, he delivered the type of bite that only the seriously "hot" Amazons and some Cockatoos can give...a bleeding smiley face that went right down close to the bone. I was shocked, and horrified...I'd messed him up! I'd put him back the way he used to be! I moved Cosmo back out of the room, and within 12 hours Basil was his calm, passive self again. I thought I had it figured out. Spring arrived, and things began to change. Basil started to snap at me, began to display all those beautiful Amazon hormonal signals; pinned eyes, flared tail, half-spread wings. One day, as I was moving ChaCha the Nanday, it all came to a head. Basil dived off the perch and went for my head, talons first. When I replaced him on his cage stand, he screamed. Several times when I came in the room, I'd find Basil on ChaCha's cage, and poor little ChaCha bravely trying to drive off the giant invader. It was clearly stressing ChaCha, and Basil was being driven crazy. He also started plucking again. Time to separate them, clearly. But, I didn't like the idea of Basil all alone, which apparently was what he "needed" in order to be calm. Meanwhile, in another area, we had Chester. Chester is a goony old imported Mealy Amazon, big and chunky, and handicapped by the loss of several toes. 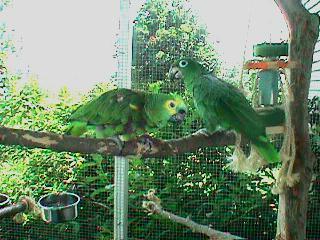 He was making himself a nuisance by trying to be sweet to some of the other Conures, which of course terrified them. He didn't mind human contact, and would sometimes ask for pets; but basically he wanted a bird friend. Here's where the breakthrough comes in. And I have to say that it came after weeks of prodding from my wife. What if I put the two Amazons together and let them bond if they wanted? So, we moved the two of them into a room all of their own. It took about a week for them to start perching together and preening each other, and in another week, we no longer needed separate cages for them. They sat side by side, they groomed, andthey played! I'd never seen either of them play before! Have you ever watched grown male Amazons wrestling in the branches of a tree? Swinging around and twirling and nipping and spreading their wings and hanging upside down? They were happy. As a side benefit, Basil stopped plucking, and is now in beautiful feather. And, what about their behaviour towards humans? 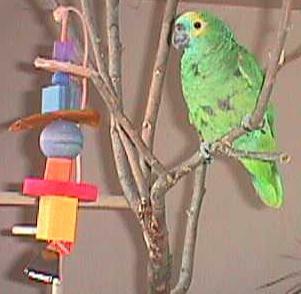 Most of the time, they step up and down on request, and can be handled as needed to move them from perch to cage etc. Once in awhile, one of them will lean out and slash at me as I walk past their cage. And during spring and summer, Basil will sometimes step up, then bite without warning. This has happens often enough that my students in Fall semester classes ask me what is wrong with my hands, because they've always got smiley shaped scabs all over them. And I'm their FAVORITE person. It's worse for my wife, who can only handle them with a perch, and is often jumped when she enters the room. At this point someone is saying "See, they were right; you shouldn't have put them together." Hmmm.well maybe. But here's where the heresy comes in. Basil will probably never be a pet, unless I separate him from all other birds and work intensively with him; and there are people who'd do that. I have no criticism for them. I know how to do it too. Chester could have been a pet, if I kept him away from other Amazons. But, would either of them have been as happy? I don't think so. It's more important to me that they be happy birds than good pets. Does that mean I'd release them if that were possible. Sure I would. If I could reverse a couple of hundred years and put every parrot on earth back in the trees where they came from, I would. But I can't. Few of our birds could survive in the wild, especially in the climates where many of us live. The closest I can come is to stop thinking of what will make them better pets, and start thinking of what will make them happier birds. Some of them want to be pets. That's a choice they are able to make, and able to show they've made. I have two parrots clambering on me as I type. They are free to be my friends. They are also free to be birds. They get to choose, or combine the two.